In Spinbackup by default only a route administrator has access to a business account. However, it is possible to assign additional administrators, and give them flexible access level. Tap the Log in as G Suite / Google Apps Administrator button in the upper right corner. 4. In your dashboard on the left, click Users. 5. You will see a list of all your domain users subscribed to Spinbackup. Choose the name of a user you will nominate as Admin, unfold it by clicking +/- button and click the Change permissions button under the user’s name. 6. In a pop-up window, switch on the Is Admin button, switch on the functions you want a new administrator to have access to and click Save. You can change these settings in the future if needed. 7. The Login function gives the nominated admin permission to log in to the Spinbackup account and see the Dashboard. Until this button is switched on, the system will block the user’s attempts to log in. 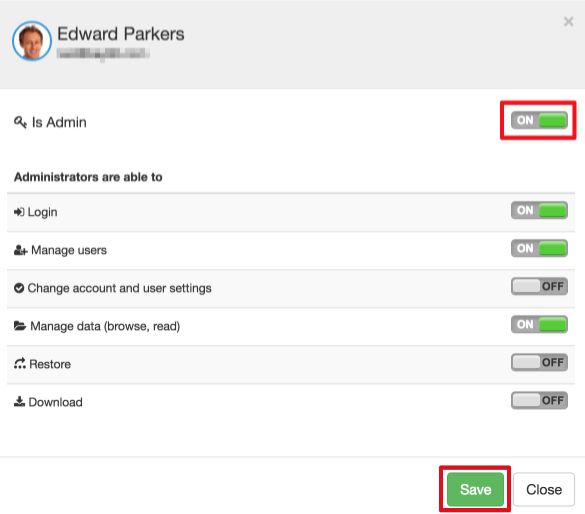 The Manage users function gives the nominated admin permission to add and delete users to / from the Spinbackup account.To learn more about how to use the User Management Console, watch our User Management Console (video demo). The Change account and user settings function gives the nominated admin permission to manage account default settings and other users’ settings for the auto backup services, Trash, Spam and Shared files autobackup.The nominated admin has access to his/her auto backup settings, no matter whether the Change account and user settings function is switched on or off.To learn more about how to manage the account autobackup default settings, watch our Settings (video demo). 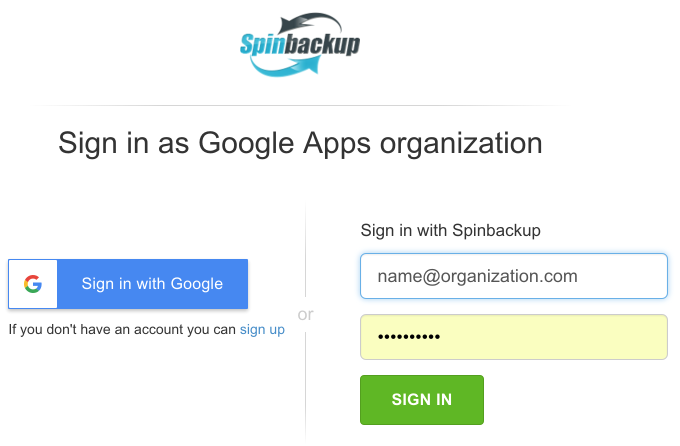 The Manage data (browse, read) function gives the nominated admin permission to open the other users’ Spinbackup windows for backed up Google Apps, and view the backed up data of all versions with all details.The nominated admin has access to his/her own backed up data, regardless of whether the Manage data (browse, read) function is switched on or off. The Restore and the Download functions give the nominated admin permission to use the Spinbackup restoration and download services.By default, this permission concerns the nominated admin’s data. To give the nominated admin access to restore other users’ data, both the Manage data (browse, read) and Restore functions must be switched on. To give the nominated admin access to download other users’ data, both the Manage data (browse, read) and Download functions must be switched on.To learn more about how to restore data from the Spinbackup account, read our Google Account: Deleted Data Recovery article.To learn more about how to download data from the Spinbackup account, read our How to Download Google Data from Spinbackup to a Local Device article. You can see the icons representing the nominated admin’s switched on functions in the Users section. Remember that the route admin can change the nominated admin’s permissions and revoke the admin’s access at any time.